At times, I have been accused of going to Barrow for a vacation. But I've been pretty busy and have been working in the building for about 10 hours per day. And they moved me to another office within the building again. Since we now have some locking storage in the new office and a door that opened directly into the hallway, I didn't mind moving. Not exactly my version of a vacation. This was dinner at the local Japanese restaurant I think on Wednesday. Miso soup, ikura, and loco moco. What a combination. Ikura is salmon egg sushi and loco moco is a Hawaiian dish made of rice with a hamburger patty and a fried egg on top all covered with some sort of generic brown gravy. Before this meal, I hadn't eaten anything for a day or so. I didn't finish what I had ordered. Overall, the meal was pretty good. 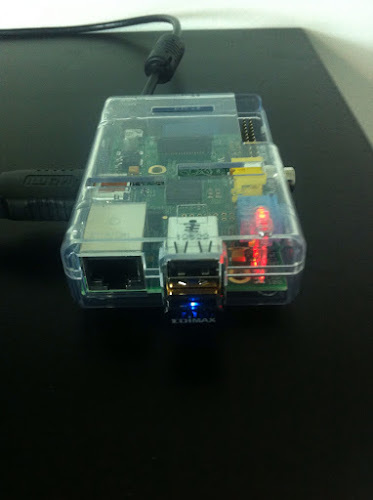 One of the fun tasks was setting up and testing the Raspberry Pi microcomputers running XBMC software. Here is the entire computer with the HDMI video cable coming out the left side of the case, the micro-usb power supply on top and the tiny wireless usb interface (with the blue light) on the front. They will be velcro'd to the back of the television monitors. To control them, you can use an iOS app or the built in web server. I'm pretty impressed with the capability. You can even use AirPlay from your Mac or iOS device to show movies. I had wanted to set one up on the conference room projector but it doesn't have an HDMI input. This means that I need to pick up a HDMI->DVI-D cable and run an analog stereo audio cable back to the audio mixer if I want sound. 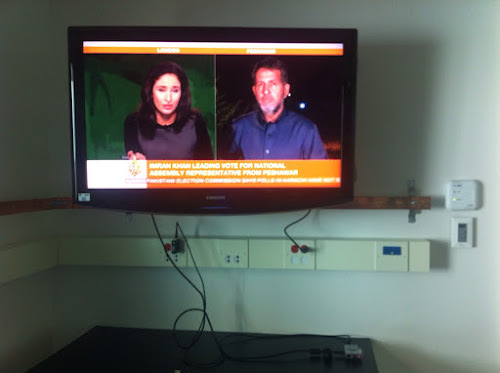 One of the apps I installed on XBMC was Aljezera English so there would be some news feed into the building. Here is one of the four screens that I have set up in the building. I also have the ability to show content from other sources within the facility. It has bee running for a day now without any real issues. It doesn't support Airplay Mirroring which would allow you to send your Mac screen to the monitor nor does it play back mpeg2 encoded video. It also doesn't seem to support MP4 videos like you would download from iTunes. But is is easy to just play them off of your computer and send them to the system. This evening I was planning on taking some pictures around town to try and give you the flavor of Barrow. Hawaii has some odd food- Spam musubi and now loco moco. That sounds challenging. Miso soup is good, tho. This place even offered Spam fried rice. Maybe Sunday morning breakfast. Loco moco is actually pretty tasty but kind of high in carbs. Here, the hamburger patties are cooked on a grill instead of a grill so it had pretty good flavor. Their miso soup is always pretty good and they serve it with everything. 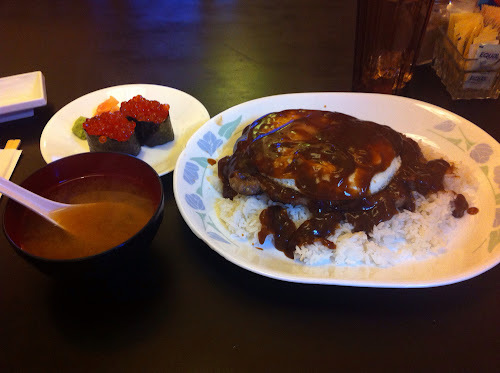 We had Loco Moco in Hawai'i but we also had Huli Huli Chicken. I can't eat as much as I used to and that's a good thing. Unfortunately, where I'm staying this time has no refrigerator so no to-go containers. I like most but not all Hawaiian food. IMHO, that poi stuff is dreadful. MMMM. Spam...Some friends of ours recently toured the plant in MN. They brought us a little gift. I got to try 3 varieties of Spam that I had never had before. Black Pepper, Hot(Tabasco flavored), and Jalapeno. The Black Pepper, was peppery. The Hot, was tasty and I didn't need to add hot sauce. The Jalapeno, well, it wasn't as "hot" as I was hoping it would be. Now a reason to go to MN besides Aerostitch.